Ø From across the system, 40 stakeholder representatives of Jalna district – farmers from landholding categories, landless poor, women, members of the Grampanchayat, farmer movements; government officials, a scientist of the water sector, academic institutions, college students, NGOs, media – voiced their varied concerns and perspectives about the water situation in Jalna. Ø Participants agreed that the implementation of government policies and programs and collective action to manage the water resources are the two most important aspects which can help Jalna district address the water situation in the future. Ø All participants were excited to be part of this important dialogue. They valued the openness of the process and actively engaged in the same. Ø There was unanimous consensus that the TSP process should lead to concrete action executed at different levels while engaging the diverse stakeholders. Jalna, a drought prone district in the Marathwada region of Maharashtra faces serious water challenges. Some of the causes are recurrent drought, drought like conditions and notable weather changes; crop loss and failure; increasing demand on groundwater by farmers, industry, urbanization, with declining groundwater levels. Water scarcity for domestic and livelihoods (mainly farming) needs of rural households is of grave concern. In recent times, thousands of families migrated to cities and towns in distress, in search of sustenance. While water requirement for industry and urban needs are met from the Jayakwadi dam, most of the rural population depends on declining ground water and infrequent tankers in times of scarcity. At the same time villages, NGOs and government have taken up water conservation projects such as watershed development, the MGNREGS etc. with encouraging results. However the demand side management practices are poorly followed. Other practices such as lifting safe ground water into surface ‘farm ponds’ aggravate inequity and increase evaporation losses, and the improper implementation of land treatment projects negatively impact the biophysical structure of the land with long term negative impacts on water availability. Finding sustainable solutions to this complex water issue is beyond the capacity of any single agency. It necessitates the active engagement of all stakeholders. Developed by Reos Partners, Transformative Scenario Planning (TSP) offered a neutral space to present multi-stakeholder perspectives, to create a shared understanding of what is happening, and together to develop a way forward towards the desired outcome. Structured around the development and use of scenarios, it provided a framework and language for strategic dialogue within and across stakeholder groups. The workshop brought together 40 women and men representing various groups, who have a stake and may influence the water situation in Jalna district. The participant group consisted of farmers from different categories (rainfed, irrigated, horticulture, livestock), landless and women, members of Grampanchayat and CBOs, government officials from district and block levels, community leaders, academic institutes, scientists, NGOs, private institutions, journalists, industries and students. Participants voiced their opinions regarding water in the district. The important concerns raised are: decreasing livelihood opportunities in rural areas; changes in livestock pattern; distress migration to cities; health problems due to inadequate and polluted water; farmers suicides because of crop losses/failure and the debt burden; water privatization observed in packaged water bottles and farm ponds etc; increase in cultivating water guzzling crops; increase in tanker dependency; and climate related events such as unseasonal weather events and temperature rise. Besides these, inadequate resources and the lack of political will to solve the water problem was also voiced. Can we sense what is possibly going to happen in future? 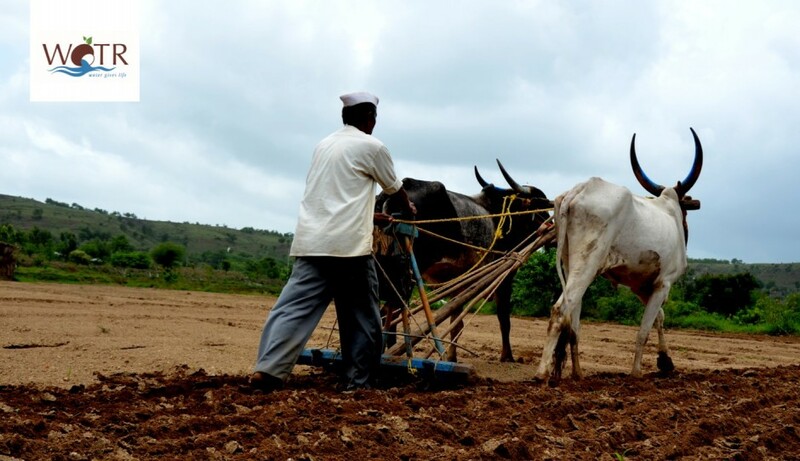 How can recurrent drought-like conditions in Jalna be addressed effectively? To what extent would the climatic factors affect water availability and livelihoods? And will farmers be forced to commit suicide even in future? Can farmers change their approach and use water more judiciously and also share water with other farmers? How will the increasing demand of water by industry affect the demand by agriculture and that for domestic use in rural areas? Can Public Private Partnership (PPP) be strengthened to address the different water challenges? Will state government show firm willingness and deploy adequate resources to implement the existing Laws and Acts in the water sector? Can this TSP workshop lead to concrete actions? To understand the current situation in the water and related sectors in Jalna district and in the state of Maharashtra, headlines from mainstream newspapers of the last 2 months were used. The exercise illustrated how water is associated with the Social, Technological, Economic, Ecological, and Political (STEEP) aspects. One-on-one sharing during a paired walk helped participants to voice their concerns and questions about the future of water in the district. In an iterative process, 21 drivers were identified which were broadly clustered as: water management, crop planning, new technologies, mentality of water users, water policies and its implementation, impacts of climate change, water allocation and access, deforestation and depleting groundwater. A voting process, debate and discussion helped narrow down to two highly uncertain and most impactful drivers which have high potential to influence the water situation in Jalna. The two key drivers identified are 1) Implementation of Government Programs (Effective Implementation or Ineffective Implementation), and 2) Collective Action (Strong or Weak) that formed the axes for the possible future scenario construction. Based on the interactions of the driving forces plotted on two axes, participants were divided into four groups to work on building scenarios. User friendly material – chart paper of different colors, colored sheets, modeling clay, crayons, color sketch pens, scissors and glue were provided to the four groups to develop their models of how in their given context, they imagined the water situation in Jalna district in 2030. After presenting the models to the others and receiving feedback, each group prepared the headlines indicating the different steps in the process that would move from the current context to the respective possible scenario in 2030 (as constructed by the group). At every step the participants were urged to build scenarios that were challenging, yet plausible and relevant in the Jalna context. After integrating the feedback from other participants, each group presented their story to the plenary in the form of a role play. The stories constructed during the workshop will be collated and refined by the scenario writing team in the next few months. A one day write-shop is planned, where the story-writers would invite suggestions and feedback from selected participants of their respective groups and others to ensure the stories are relevant, challenging, clear and plausible. These stories will serve as the foundation for strategic planning in the second workshop to be held in January 2018. The aim of the TSP 2 workshop is to identify steps to address the current scenario that has potential to transform the future, in relation to the water situation in Jalna district. This workshop was carried out with guidance from Reos Partners through the Adaption at Scale in Semi-Arid Regions (AASAR) project supported by UK Government’s Department for International Development (DfID) and the International Development Research Centre (IDRC), Canada. We acknowledge Hindustan Unilever Foundation (HUF) for providing the financial support for this workshop. The views expressed in this work are those of the creators and do not necessarily represent those of DfID and IDRC, its Board of Governors, the HUF and WOTR. ← Why farmers are growing cotton when water is scarce?